WELCOME TO THE FASTERCOURSE CAPTIVATE GUIDE! To open and use this template package you need to have Captivate 9 or a newer version of Captivate authoring tool. The main idea behind this guide and templates is that by using our templates and this guide you will be able to create your own Captivate courses. We will show you how you can quickly create new pages, by using already pre-designed and pre-programmed templates. To add a new slide you have to click on tab Slides and choose one of the options. In case you are willing to add a new slide from one of the existing ones in our templates, you can simply duplicate it. Under the Text tab you can add simple text field as well as animated one. The next tab is Shapes, where you can find different types of already drawn shapes. Every one of them you can turn into a button. When you select the shape you want to use as a button, you have to open Properties panel on your right side and under the section Style name check the option “Use as Button”. To add a new Button, Click box or Drag and drop interaction select the Interactions tab. Under the tab Media you can add images, video and audio. Images you can also simply drag into the slide from your files. If you press the Record tab it will open a new window where you can record your voice, edit it and add it to the slide. To change what you see on slide while working on it go to Timeline tab and click below the eye icon next to the object you want to hide. You can also lock objects or layers. The layer and its corresponding object cannot be edited or moved until you unlock the layer. 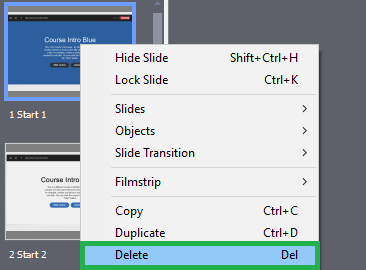 Select the slide you want to remove from the filmstrip and choose “Delete” option from right-click menu. Before you do that, make sure that there are no important actions for this course in this slide, otherwise some things may not work afterwards. 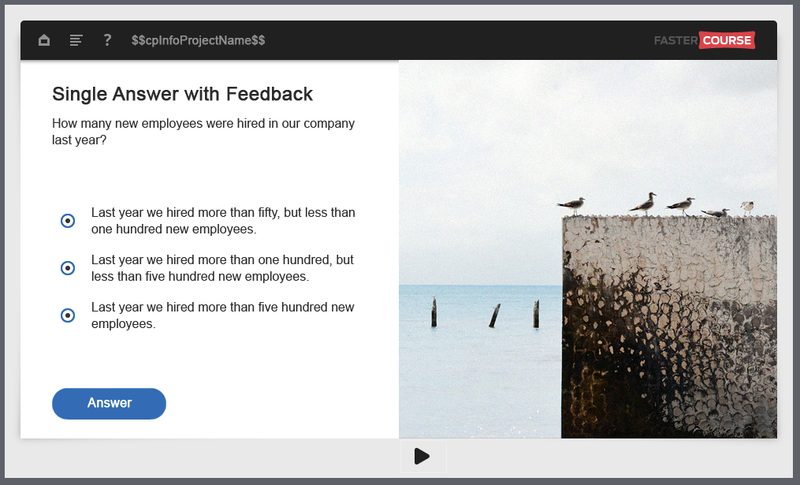 In most of our templates course menu and help page is placed at the end of a filmstrip in two different slides. To remove these slides you will have to delete them (the same as you delete every other slide) and you will have to get rid of every menu or help button. To delete these buttons, you will have to go through all slides and delete each and every one of them. Here you can change the object name and visibility ( the little eye icon). If it’s crossed over it means that the object wont be visible when entering the slide. For every object you can choose different style, actions and other options. Here you can see all style elemets you can change. If you select the Action tab, you can change the action for this object. Under the Options tab you can see the size and position of the object and also change it. These small icons represents groups. You can group objects by selecting at least two of them and then click on the right side of timeline and choose “Group” option from right-click menu ( or you can do the same using Ctrl +G). If you want to add an object to existing group, select the object and the group you want to add it and do the same. On the right side of the screen you can open Properties panel or see the Library. 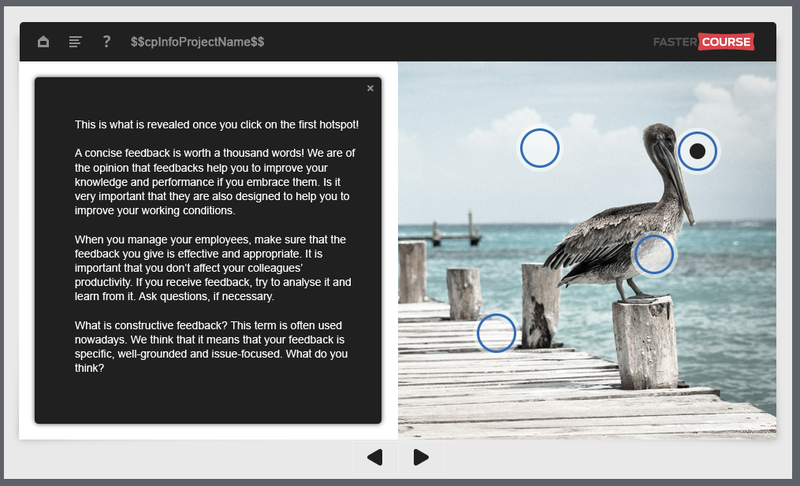 In Library you can see all objects that are used throughout the course – images, videos, audio, shared actions, etc. There you can delete the objects you no longer use in your course. In Properties panel you can change the slide title and choose between different master slide templates. In our templates we usually provide few different master slide options to choose from. Mostly they consist of Logo, Project name and sometimes page count. In master slide you can’t add buttons, but you can add a smart shape ( shape that you turned into a button) with an action. You can also add navigation buttons on your master slide with this feature. In our templates we use built-in Project name variable ($$cpInfoProjectName$$). Value of this variable you can change in – File/Project Info/Project name. If you want to change the image, first you need to select the relevant object on the Timeline or you can select it by simply clicking on it. Then go to the Properties panel and under the Style tab you can load a different image from your computer or library. This is very similar to changing an image. You also need to select the right object from the File Explorer and then go to the Properties tab and change the video source by clicking on the folder icon. Help button (shows information about buttons and objects in course). If you look at the filmstrip of our templates, menu and help pages are located in the end of the course as the last two slides. Both in Menu page and Help page there are two buttons that have the same action. Here you can see the example of menu page where these two buttons takes user back to the last slide visited. The other buttons are inactive. In Menu page you can change the text for each text field and for every one of them there is an action – Jump to slide where you can select the slide you want from all the available slides in your course. 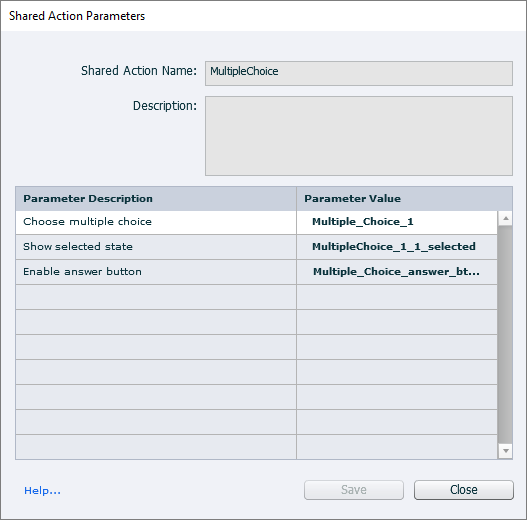 What is the difference between Advanced action and Shared action in Captivate? The difference between these two are that you can use advanced action multiple times in your course, but only with the same objects and conditions. And it’s not very convenient if you have similar pages in your course. Shared actions you can use as much as you want and every time you can set different conditions and objects that will take part in particular action. Once you have clicked on “Save As Shared Action…” you will see this window. Here you can change the name of the action and write the description that will be seen every time you change the parameters for this action. Under the description you can see the objects you pick in the advanced action and also conditions if there are any. Right beside every object you have to write the parameter description – basically what you want to do with every object. Here you can see the same 3 objects as in the Advanced action parameters in previous page and the same actions written beside them. Once you click save, there is nothing you can change in parameters or descriptions. If there is something wrong, you have to make the whole shared action again. To set a shared action to a button or a smart shape you have to go to Properties Panel and under Actions tab select Execute Shared Action. Then you will see a parameters button which will open a new window. 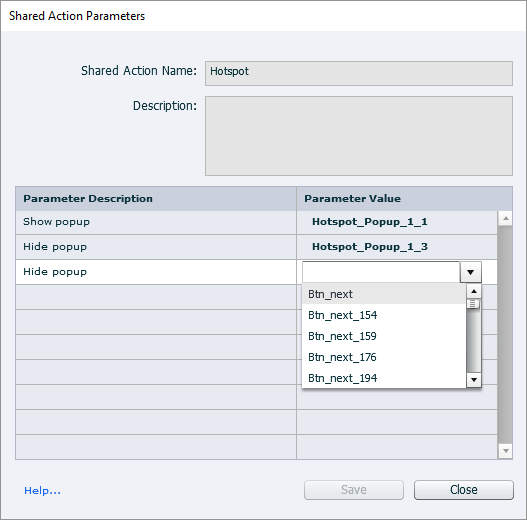 Choose the correct shared action from drop down and set the new parameters. 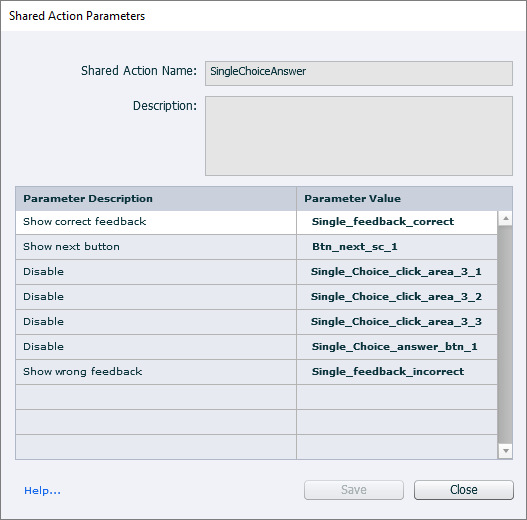 Here you can see Shared Action Parameters window. Here you can see the written descriptions and choose values or objects that will do the following thing. Simply choose the object (popup, group, button, etc.) from the drop down and select it. These values you can change anytime. To add a new hotspot to your page, you need to duplicate one of the existing ones. This means that you will have to duplicate both the button and the popup. When it’s done you can place the new hotspot button wherever you like on the image. Each of the hotspot buttons executes an action called Hotspot. 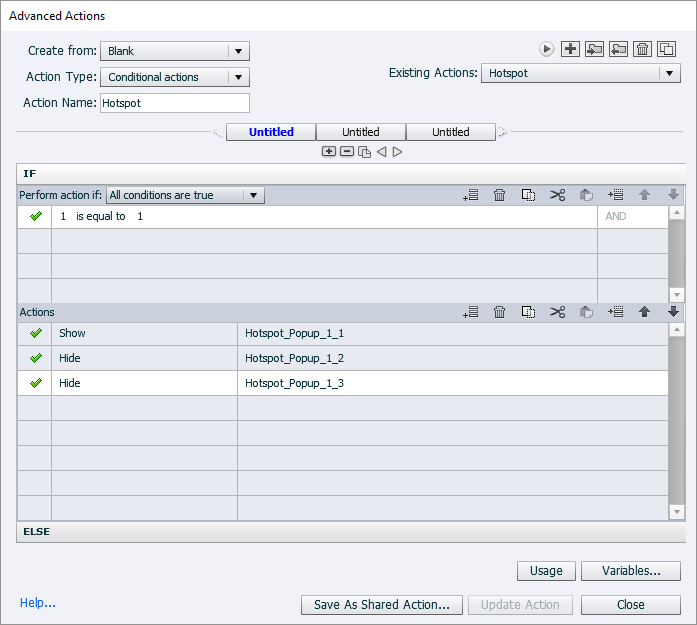 You can see the action parameters in the Properties panel under Action tab. This action is set to show one hotspot popup and hide others so they wont overlap. If you want to add a new hotspot or delete one of the existing ones, you will have to make a new shared action and change it to every hotspot button. 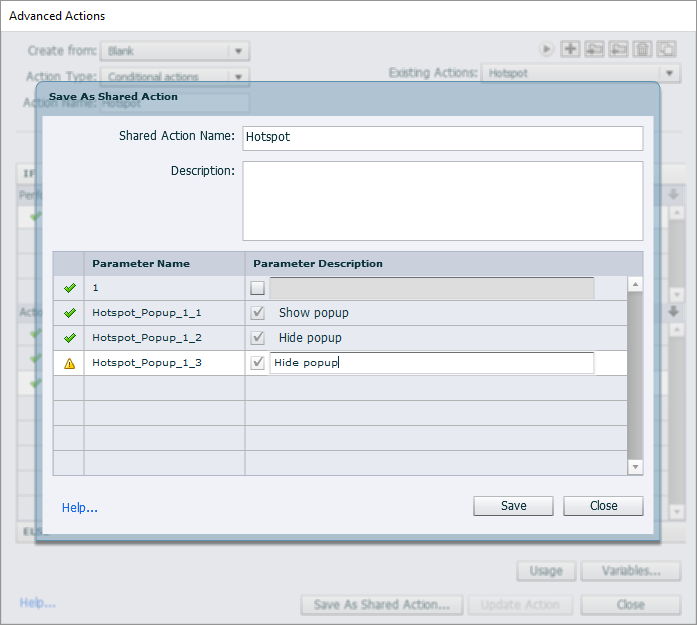 Go to Advanced actions and select Create from: Hotspot. Now you have all the same actions as Hotspot advanced action, but no objects selected. If you added a new hotspot – add another Hide action ( because now that you have 4 hotspots you want to show one and hide three others). If you deleted one hotspot – delete the last Hide action. After the changes save the action as shared action. Once you have done all this you need to set the new action to every hotspot button. 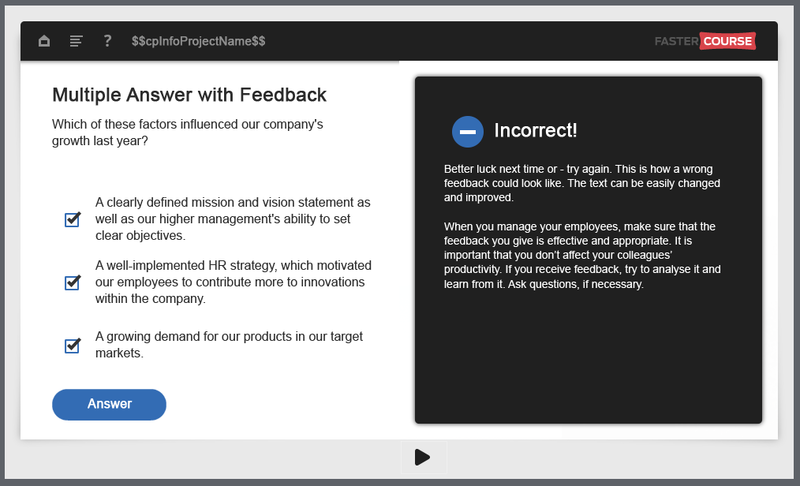 Here you can see one of the test slides with single choice question and feedback. There are two feedbacks and 3 answer choices. For now both feedbacks are hidden. 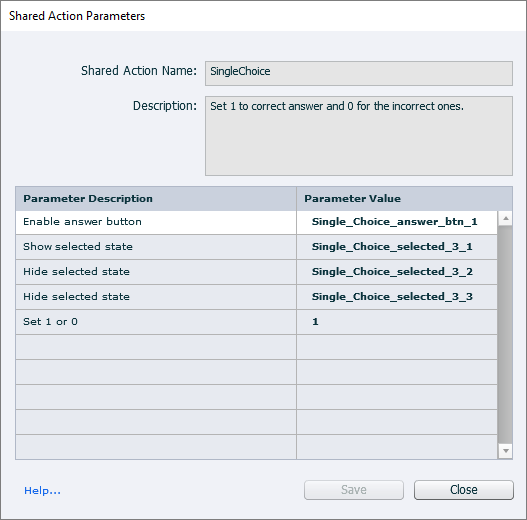 For every choice there is a button that will execute shared action SingleChoice. You can see that this action change states to all three answer choices. It also enables answer button ( so it wont be possible to answer without selecting any choice) and here you can also change if this answer choice is correct or incorrect. If this is the correct answer choice, write 1 in the last line and for both other options you will have to write 0. Once you have set the correct parameters for every answer choice, you can take a look at the action that is set to an answer button – SingleChoiceAnswer. This action will calculate if the user answered correctly or incorrectly and will show the right feedback for each case. It also disables all buttons so the user wont be able to change his mind. If you want to add another answer choice, you will have to do similar as with hotspots. First, duplicate one of the existing choices. Then go to the Advanced actions and create new actions – both SingleChoice and SingleChoiceAnswer. For SingleChoice action you will have to add new selected state that you will hide among others. In SingleChoiceAnswer action you will have to disable the newly created button. 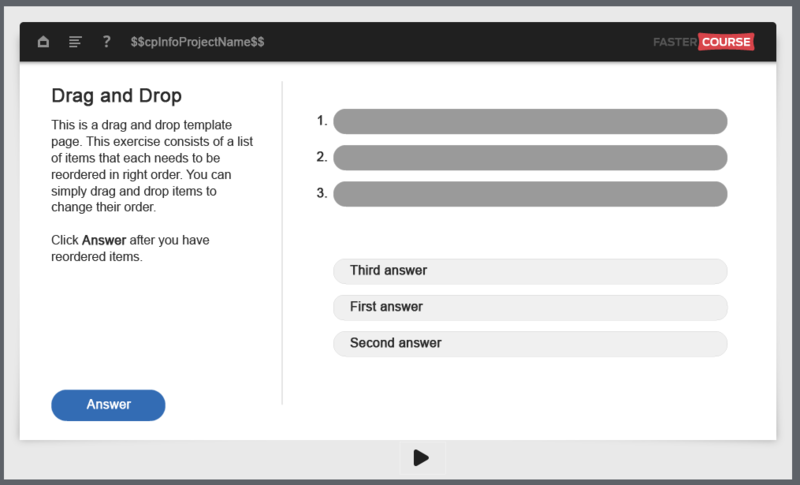 Here you can see one of the test slides with multiple choice question and feedback. It looks similar to a single choice question, but the setup is a bit different. Here you can see MultipleChoice action. 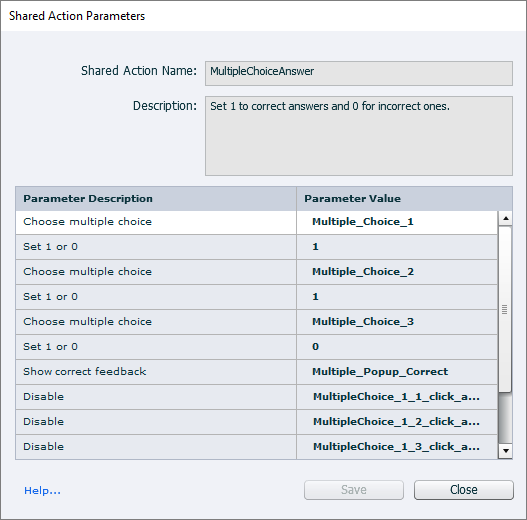 Once you have set the correct parameters for every answer choice, you can take a look at the action that is set to an answer button – MultipleChoiceAnswer. In this action you can set the correct and incorrect answer choices. Simply choose all answer options and if it’s correct – write 1 and if it’s incorrect write 0. It also disables all buttons so the user wont be able to change his mind. If you want to add new answer choice you will have to remake MultipleChoiceAnswer action. You will also have to add a new variable (for instance Multiple_Choice_4). You can do this in Project / Variables… After that you create new action with 4 options instead of 3. 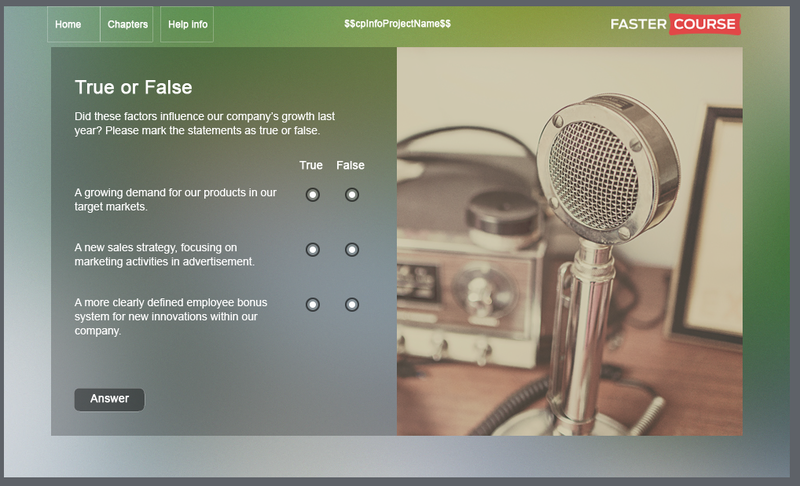 Here you can see one of the test slides with true or false question and feedback. 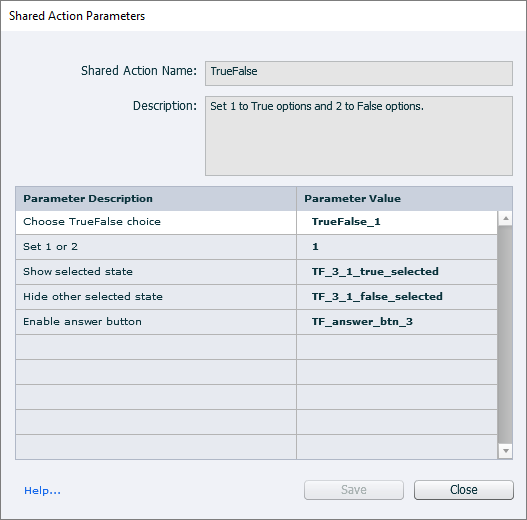 There are two actions that are used in True or False question slides – TrueFalse that is set to every radio button and TrueFalseAnswer that is set to answer button. In TrueFalse action you have to choose different variable for every answer option. It also defines if this is the true option button or false option button ( but not if it’s the correct or incorrect answer). It also changes states between both answer choices and enables answer button. 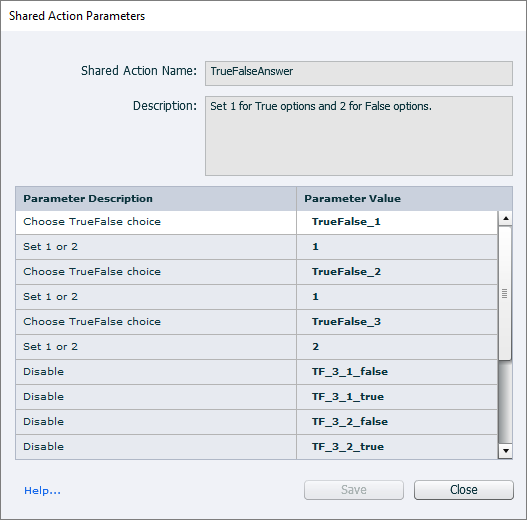 In TrueFalseAnswer action you can set which is the correct answer to every true or false question. If true is the correct one, write number 1. If false is the correct answer write number 2. This action also disables all buttons and shows feedback accordingly to the given answers. 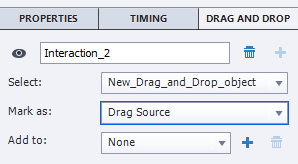 To open drag and drop options you have to go to Window / Drag and drop. It will open a new tab on Properties panel together with Properties and Timing tabs. You can turn any object into a drag and drop object. Select the object you want and go to Drag and Drop panel. There you can mark it as a Drag Source or Drop target. Then go and change Correct answers and include the new object.